I posted the blog article below nearly 18 months ago and wanted to update you. Over the last year Sophia has been through an extensive gut protocol as she had Strep gut, a parasite and consequently gut dysbiosis. This was causing her terrible constipation and no matter what she ate, her bowels weren’t getting better. After extensive stool testing with Bioscreen Medical we were able to identify her bacterial colony counts. And it was astounding – no Lactobacilli despite taking this probiotic every day! I have long held the belief that gut health is at the seat of both chronic disease and optimal wellbeing. Despite all my efforts to keep Sophia well, we weren’t getting good results until I looked further into her gut health. With the intensive protocol complete, Sophia no longer suffers constipation and she is no longer getting tired patches. Throughout all of this, jelly vitamins have been a staple. I now use a tablespoon of Great Lakes gelatin for every 250ml liquid, its the only one that is clean and free from nasty chemicals. I also use chemical free Hoppers food colourings to make them colour coded. Toddlers are so visual and Sophia loves this part! This week I am using some herbs in Sophia’s jelly vitamins to help clear a residual cough. Every day she has three which can contain anything from vitamin D to zinc to probiotics. All I know is that without them, I wouldn’t be able to get half of the supplements in! 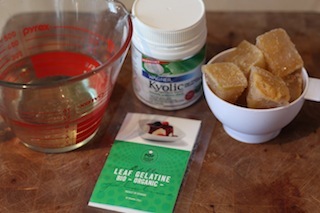 Key Message – Using jelly vitamins as a vehicle for herbs and supplements is super easy! Action Point – purchase some Great Lakes Gelatin, a silicon mini muffin tray and some Hoppers food colouring and get started! Both Sophia and I adore our jelly vitamins as they are the easiest way to get supplements into small children. I load them up with all sorts of therapeutic goodies such as probiotics, zinc, herbs and Kyolic aged garlic extract. Whenever I feel Sophia is starting to fight an infection I make a batch and they really help to prevent her going downhill. I have been known to snack on them too! Cut up gelatin sheets and soak in cold water for 5 minutes. This will allow them to swell. 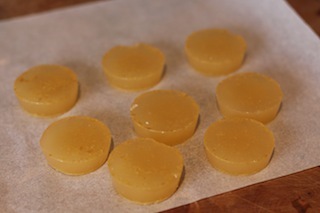 Remove the expanded gelatin from the water and gently squeeze out excess water. Add apple juice to saucepan and very gently heat to just about luke warm. Add the gelatin and stir continuously until dissolved. The idea is to only heat up the juice enough to melt the gelatin – too much heat will reduce water soluble vitamins such as vitamin C.
Once gelatin is dissolved, take off the heat and set aside for a few minutes. Pour in vitamin of choice and stir well. 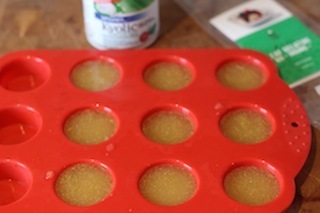 Spoon into silicon tray and put in fridge to set. Once completely set, run a hot knife around the edge and pop jelly vitamin out. Then enjoy and have fun eating them together! Remember that you can use whatever fresh, organic juice you like.